Twitter can be a great way to increase engagement with your current patients, ultimately improving patient retention. And, as part of your online dental marketing plan, it can even be a source of new patients as you build a reputation on social media and direct people to your practice website. Well, your patients probably spend a great deal of time tied to their electronic devices. Let’s say your patient, Susan, is following you on Twitter and checks her Twitter feed during her lunch break. She sees your tweet, reads the article you shared about flossing, and then remembers that she’s overdue for her cleaning. She closes the Twitter app and calls your office to schedule. Twitter differs from other social media platforms like Facebook in that there is a character limit on all posts. You only get 140 characters per “tweet.” Only 140 characters to share oral health tips, link to interesting articles, and promote your practice. It may sound tricky, but it is definitely doable with a bit of planning and careful wording. To help you on your way to becoming a Twitter aficionado, here are some post ideas with real-life examples from dental-related Twitter accounts that are doing it right. If you read an article online that you find particularly interesting and you think your patients would find it interesting, too, share it! Even better if it relates to dentistry and oral health. 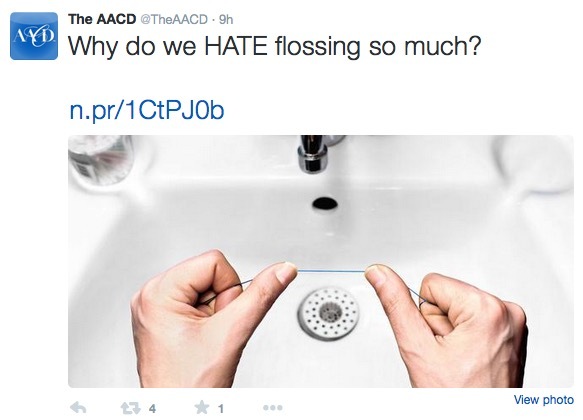 Take this tweet from the American Academy of Cosmetic Dentistry, for example. They maximized their 140 characters by coming up with an intriguing question to pose to their followers, linking to a relevant article on the topic from NPR, and even included the eye-catching image from the article. Twitter’s “short and sweet” format lends itself well to sharing interesting, one-line stats and facts. And since many people are on the go when checking Twitter, these types of tweets that are self-contained (i.e. don’t link out to another source) are easily consumed. Check out this tweet from the British Academy of Cosmetic Dentistry. It’s interesting, relevant to their audience, and doesn’t require the reader to click to another website to get the information. There is a ton of great content being tweeted every day on Twitter. Follow some of your favorite industry leaders or resources. When they post something you think your own followers would enjoy, retweet it! This is a great way to tell the user you retweeted that you appreciate their content while sharing something interesting with your own followers. Do you blog on your dental website? If so, make sure you share each new blog post on Twitter. If your post URL is long, you can use a free URL shortener like bitly to shorten it for your tweet, come up with a catchy headline, and tweet away! This will get your content out there to your patients, make it findable on Twitter for prospective patients, and send quality traffic to your dental practice website. It’s a win-win-win! If you haven’t given Twitter a shot yet, go ahead and try it out. Click here for step-by-step instructions for setting up an account. If you are on Twitter, try to vary your tweets using some of the suggestions above to keep your followers engaged. Need some ideas to improve your online presence? 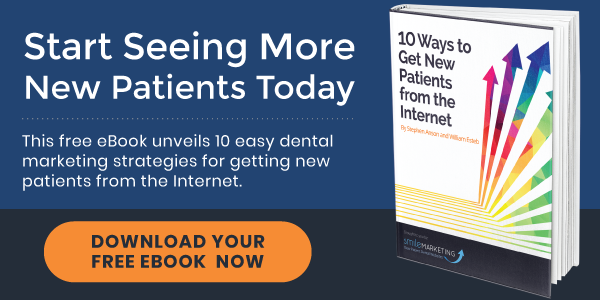 Download our free eBook for 10 actionable ways to get more new patients from the Internet.